Story of a Cherub. From glory to destitution. From beauty to ugliness. From wisdom to dumbdom. The concept of cherub comes from the Bible and is not a rosy faced kid-like, multi-winged angel you see in a lot of Baroque art with divine overtones and on cupid cards at Valentines. Last week I quoted Job 38.4-7 about sons of God shouting for joy at the foundation of Earth. Indicating that alien beings (certainly not humans because Earth didn’t exist yet) were present before this foundation. That amongst these sons of God was a cherub. Let’s take a closer look. This is in the context of a beautifully created Earth and its description of becoming tohu va bohu in Genesis 1.1. We’re going to see how it went from the positive to negative state. 12 Son of man, take up a lamentation upon the king of Tyrus, and say to him, Thus says the Lord God; You seal up the sum, full of wisdom, and perfect in beauty. 13 You have been in Eden the garden of God; every precious stone was your covering, the sardius, topaz, and the diamond, the beryl, the onyx, and the jasper, the sapphire, the emerald, and the carbuncle, and gold: the workmanship of your tabrets and of your pipes was prepared in you in the day that thou were created. 14 You are the anointed (Strong’s H4473) cherub that covers; and I have set you so: you were upon the holy mountain of God; you have walked up and down in the midst of the stones of fire. 16 By the multitude of your merchandise they have filled the midst of you with violence, and you have sinned: therefore I will cast you as profane out of the mountain of God (cast down to Earth): and I will destroy you, O covering cherub, from the midst of the stones of fire. 17 Your heart was lifted up because of your beauty, you have corrupted your wisdom by reason of your brightness: I will cast you to the ground (H776 erets-Earth. Earth is this alien’s domain see Job 1), I will lay you before kings, that they may behold you. 18 Thou have defiled your sanctuaries by the multitude of your iniquities, by the iniquity of your traffick; therefore will I bring forth a fire from the midst of you, it shall devour you, and I will bring you to ashes upon the earth in the sight of all them that behold you. We could spend many pages just on this context, but we’ll move along at a quick pace. In verse 14 the Cherub that covers refers to Exodus 25.20 where 2 Cherubim are associated with God’s throne and their outstretched wings that cover it. This Cherub is ‘anointed’ meaning, set aside for a special task associated with the very holy mountain of God. In other words, not just anywhere, we will see this is a reference to the place where He reigns from, today we’d call it ‘headquarters.’ This is a scene from Third Heaven. All this is God’s doing, notice that He says: ‘I have set you [the Cherub] so.’ This is confirmed by verse 13 where it indicates the Cherub’s presence in Eden, God’s garden. There’s a ‘duality’ here too because this is not the same physical garden of Eden where Adam and Eve were (at this point this couple was still a long way off in the future.) In Ezekiel the Garden refers to God’s spiritual abode where this Cherub is very well off as depicted by the richness and exquisiteness of his clothing. Especially notice that God created this Cherub putting him in the category sons of God. Cherubim are amongst the highest ranking created spirit beings. The conclusion we can draw is that God had a very important role for this Cherub to play in whatever His universal plan is. This Cherub had been specially prepared by God. Indeed it had been equipped with a brim full pitcher of wisdom and beauty (vs. 12) so much so that he was ‘perfect in all his ways’ (vs. 15). I think perfect in all his ways really gives us a precise descriptive picture of who this alien being is. When we consider the contours of this spiritual puzzle piece: This Cherub has a top position in God’s entourage. I know you’ve read vs. 15-18, amazing isn’t it! Clear and easy to understand, short and shocking. You’ve just got your mind round one of the pivotal pieces in the puzzle. A piece very few compatriot humans comprehend or accept. The ‘fade out’ in verse 18 reverts back to the King of Tyre but also refers to the Cherub: heart lifted up, corrupt wisdom, multitude of iniquities and iniquity of your traffic, referring to his fraudulent economic practices in general. This perfect spirit being, a son of God, by creation, has completed the total evil makeover. Yes, it was identified by excellence but, as verse 15 confirms, till iniquity was found in you. At a given point in spiritual time (yes, there is such a thing: consider that eternal involves time immemorial) wickedness slowly began to invade and characterize this Cherub. Your heart was lifted up because of your beauty, you have corrupted your wisdom by reason of your brightness (vs. 17). Here is the original vanity, the prototype of pride. This Cherub’s majestic grandeur went to its head and it floundered. A different, grotesque and hideous nature reared its ugly head. Genesis 1.1 reveals a beautifully created Earth devastated by tohu va bohu. Ezekiel reveals a beautifully created Cherub similarly descending into spiritual tohu va bohu ( till iniquity was found in you… you have sinned… your heart was lifted up… you have corrupted your wisdom). There is a direct relationship between the two: Spiritual corruption leads to physical devastation. Sam’s Reflection The Bible does not say how long this transformation from beauty to repulsion took. What we need to understand is, it’s a process that takes time. It starts out with wrong thoughts that lead to wrong actions. As the thoughts go from bad to worse, so does the behavior. A literal change of mind is taking place. The plasticity of the mind allows for molding the mind in both a positive and a negative direction. I’m going to come back to this period of the Cherub’s existence but I would like you to think about something: What was God’s reaction and what did God do about this situation? After all, God had created this beautiful son of God. He was present and witnessed this slide into oblivion of this very close son of His. What did He do about this situation? Fiction or reality? You decide. But it’s there, in the Bible in black and white, written by a man, Ezekiel, in the 6th century BC referring to events that go back billions of years regarding the Cherub and prophecy a hew hundred years into the future regarding the King of Tyre! It seems to be saying that this Cherub followed this path of its own free will. It, of and by itself, somewhere, somehow began to make decisions to go down this path of depravity. Apparently it had a mind of its own, and what a mind, but it could use it as it pleased, it was up to this Alien to choose from the different options it could reflect and ponder over. If that is the case (and the author confirms that Galacti has it right) then God is not the cause of ‘evil.’ In fact it’s just the other way round… God created a splendiferous spirit being, perfect in all its ways, and that being went off the deep end–all by itself. I wonder if God tried to prevent him from such negativism–did He try to turn it around? The answer is of course God tried to help the Cherub, it was a son of God and every father tries to aid his son (at least that’s what they should do) and head him in the right direction. God is no different. Frankly, to my knowledge, there’s no evidence regarding this principle during this pre-physical period but, we shall see dozens of such contexts regarding God’s relationship to man and how He works with His creation. This principle is another of the fundamental pieces of the puzzle. That quizzical look has not disappeared from Galacti’s face yet, what is it? So you’re saying God can’t do anything and everything He wants! You’re saying God isn’t super-powerful. Yes and no–how’s that for a political answer. Let me explain. God can do whatever He pleases but, He too has set Himself some rules and we see one right here. God gave free will to this Cherub—just as we saw He did with Adam and Eve. Now think, if an individual has ‘free will’ then they’re free, totally free, with no outside constraints, to decide whatever they want, whenever they want, correct? Yes. No outside constraints means not even from God! If God constrained the Cherub or Adam and Eve then He’d be forcing them into a particular decision, into the right way. And that is not compatible with giving them free will. This is an exciting subject with definite implications and consequences. I’m not putting it to rest here as it will come up on numerous occasions in the text. Think about it, free will is one piece that must fit properly beside the other pieces in the puzzle. As you put the puzzle together sometimes you hold a piece in your hand for a long time—looking over the picture, or the part of the puzzle you’ve already put together, to see where it could fit. Keep holding this piece—if you’re not sure where it fits—maybe it’ll find its rightful place later on. But, we must move on and finish this context. There’s an important result of the Cherub’s iniquity and sin: ‘therefore I [God] will cast you as profane (Sam: The Cherub is not holy anymore, it’s been demoted, lost all its privileges) out of the mountain of God: and I will destroy you. I will cast you to the ground, I will lay you before kings. I bring forth a fire from the midst of you, it shall devour you, and I will bring you to ashes upon the earth… (vs 16-18). When this Cherub reached the point of no return God took an ultimate action, stripping the Cherub of its role and ousting it from His entourage. On the physical plane the king and mainland Tyre were destroyed by Nebuchadnezzar about 573 BC, putting it another way, Tyre became tohu and bohu—void and waste. In fact the prophecy in Ezekiel 28.19 says that it would remain this way. Indeed, the supposedly ‘invincible’ island part of Tyre was demolished by Alexander the Great in 332 BC. He literally scraped it off, down to the bedrock and it lies buried in a watery grave to this day. The king and the Cherub, because of their iniquity, were the cause of their mutual demises. Likewise, this scenario describes to a tee what we find in Gen 1.2, a beautiful earth in shambles–in a state of tohu and bohu covered by water. We now know who the instigator of this mass destruction is, but, what’s its name? This blog post is an excerpt from chapter 7.5 of the book Origin of the Universe. Go to UnlockBibleMeaning.com and read Exodus 25.20 where 2 Cherubim are depicted with their wings spread out and touching thus covering the sight of God’s throne. Moses is the advanced as the author of Exodus around 1400 BC. Scholars date it at the Babylonian exile about 600 BC. Both are prior to the Baroque chubby cupids.of the 17th century. Again, it doesn’t matter what you believe, just take the Bible as literature if you want. It refers to cherub (plural: cherubim). Genesis 3.24 refers to Cherubims guarding the entrance to the Garden of Eden. Winged guardians are present in various historical settings. This word mashach, just from its sound, might ring a bell with some of you. Click on next 5 at the bottom of H4886 and do that a few times until you get to H4889 and you’ll see why mashach is familiar to you. Masshach is associated with mashiyach which is used to refer to Christ—the Anointed One. Notice that the root of 4899 is 4886 clearly revealing the relationship between these two words. 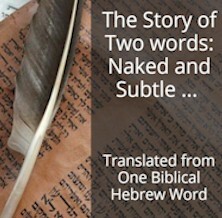 Another confirmation of the interrelation between Biblical Hebrew words that you don’t see in any foreign language. Sam’s Reflection: This online Strong’s concordance is a work in progress. There are a number of additional services that need to be added to make it even more useful. It will be responsive. In other words accessible on all mobile phones. Unless you knew that mashach (4886) is related to mashiyach (4899) you would not be able to find this with the concordance as it’s presently configured. The next iteration of the Concordance will locate ALL Biblical Hebrew words with the SAME root. Yes, you’ll be able to see ALL the words together and enhance the stories told by these words. And I can assure you they are eye-openers–as you can readily see just from this one. This anointed covering cherub was appointed to a very special role associated with the throne of God. The cherub was on the holy mountain of God as it says in the same verse. This reveals its closeness to God and the important role it plays in God’s plan. Your contributions will be used for the coming iterations of Strong’s Concordance so it can become an even greater help for your Bible study. Ezekiel 26.17 Your heart [Cherub] was lifted up because of your beauty, you have corrupted your wisdom by reason of your brightness: I will cast you to the ground, I will lay you before kings, that they may behold you. Check the word ‘ground’ in Hebrew (H776 erets). You’ll see that it also means Earth. This Cherub was cast out of the Third Heaven to Earth. This is not the only time this scenario is depicted. Look at Revelations 12.7-9 …the great dragon was cast out, that old serpent, called the Devil, and Satan, which deceiveth the whole world: he was cast out into the earth, and his angels were cast out with him. Why of all places in the Universe was the Cherub / dragon sent to Earth? Since you read all the way to here… you liked it. Please use the Social Network links just below to share this excerpt of Inventory of the Universe, A Cherub is a Very Powerful Spirit Being. Fact or Fiction?